"They are selected as members of the first batch of female astronauts in China because of their excellent flight skills and psychological quality," Xinhua reported. 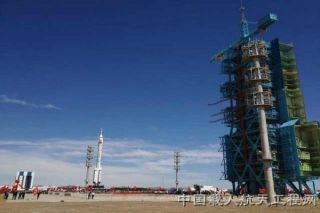 The Shenzhou 9 space capsule is due to launch on a Chinese Long March 2F rocket, from the Jiuquan Satellite Launch Center in northwest China's Gansu Province. The rocket and spacecraft were transferred out to the launch pad Saturday (June 9). This first docking mission is part of China's larger goal to build its own100-ton manned space station by 2020, a smaller version of the $100 billion International Space Station, which is a collaboration between 15 countries and led by the space agencies of the United States, Russia, Europe, Japan and Canada. China is only the third nation, after Russia and the United States, to independently launch humans to space. The first manned Chinese spacecraft, Shenzhou 5, lifted off in 2003, carrying China's first astronaut, Yang Liwei. To date, six Chinese astronauts have flown to space. Shenzhou 8 disengaged and made another successful docking with Tiangong 1 less than two weeks later. The ability to send two spacecraft to meet and link in orbit is a critical step toward being able to construct a habitable space lab. Officials with China's space program have said the country aims to build a complete 60-ton space station in Earth orbit by 2020. The country also plans to launch several unmanned moon missions in upcoming years, including plans for a robotic lunar sample-return mission by 2016. So far, China has been going alone in its spaceflight activities, though officials say they welcome the chance for more international collaboration. "China welcomes astronauts from other countries to participate in our space station and other manned space programs," said Liwei, who is now the deputy director of the office of China's manned space program, in a Xinhua article. While NASA's chief Charles Bolden has said he'd be willing to partner with China on certain space projects, some members of Congress have spoken out against collaboration with the nation. Ultimately, China has said it aims to land astronauts on the moon.